PhDWorks.org. Qualified Custom Writers Needed! 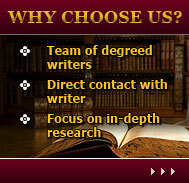 Hiring true professionals to work with us, PhDWorks.org has achieved brilliant results among custom writing services. PhDWorks.org is a wonderful place for you to embody all your writing dreams. You will earn money by doing the job you have been reaching for during many years of studies and work! Our team of custom writers is the backbone of the business; therefore, we cherish every single custom writer and know what you need: timely assistance, careful attitude, and fair salary! We are ready to give all that on condition you are ready to submit quality, non-plagiarized papers! Disregarding numerous applications coming to us every day, you still have a wonderful opportunity to be noticed. Do not forget to include your writing experience, samples of any previous woks and the reasons for us to hire YOU! Contact Us NOW! WORK WITH PLEASURE – WORK WITH PHDWORKS.ORG!